Life scientists Xia Yang and Fernando Gomez-Pinilla say their research holds the promise of individualized treatments for such diseases as Alzheimer’s. UCLA biologists have discovered how head injuries adversely affect individual cells and genes that can lead to serious brain disorders. The life scientists provide the first cell “atlas” of the hippocampus — the part of the brain that helps regulate learning and memory — when it is affected by traumatic brain injury. The team also proposes gene candidates for treating brain diseases associated with traumatic brain injury, such as Alzheimer’s disease and post-traumatic stress disorder. The researchers studied more than 6,000 cells in 15 hippocampal cell types — the first study of individual cell types subject to brain trauma. Each cell has the same DNA, but which genes are activated varies among different cell types. Among the 15 cell types are two that were previously unknown, each with a unique set of active genes. “Every cell type is different,” said Fernando Gomez-Pinilla, a UCLA professor of neurosurgery and of integrative biology and physiology, and co-senior author of the study, which was published in the journal Nature Communications. The mice without an injury had very low levels in 14 of the 15 cell types of a gene called Ttr that regulates metabolism, controls thyroid hormones and performs other functions. Brain trauma increased the level of Ttr in essentially all of the cell types, the researchers found. They concluded Ttr is important to brain health and may function to bring more thyroid hormone to the brain to maintain metabolism. A thyroid hormone called T4 was injected in mice. T4 improved traumatic brain injury-induced learning deficits and reversed changes in 93 genes that affect learning and memory. This reversal in damage caused by traumatic brain injury is a major new finding. After brain injury, metabolism is substantially reduced. The biologists think T4 may “reboot” metabolism. Researchers found evidence that at least 12 of 15 cell types are negatively affected by brain trauma, some more strongly than others. Traumatic brain injury causes changes in how cells communicate with one another (see image). “Knowing which genes in which cells are changing in a particular person can lead to the right treatment for that person,” said Yang, who is a member of UCLA’s Institute for Quantitative and Computational Biology. Read about a 2017 study by Yang, Gomez-Pinilla and colleagues identifying master genes that control other genes linked to Alzheimer’s and other disorders. Read about a 2016 study by Yang, Gomez-Pinilla and colleagues finding that fructose alters hundreds of brain genes. Co-authors of the study are Douglas Arneson, lead author and a graduate student in Yang’s laboratory; Guanglin Zhang, Zhe Ying and Yumei Zhuang, who are research scientists in Gomez-Pinilla’s laboratory; Hyae Ran Byun, a former postdoctoral scholar in Gomez-Pinilla’s laboratory; and In Sook Ahn, a research scientist in Yang’s laboratory. 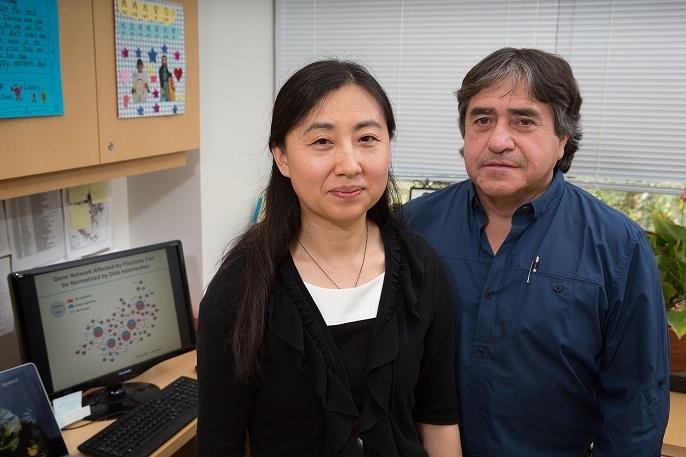 Yang and Gomez-Pinilla’s research is funded by the National Institutes of Health. Arneson’s research is funded by a Hyde Fellowship and the National Cancer Institute.